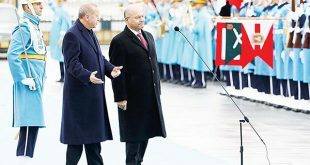 ISTANBUL, May 6, (AFP): Turkish President Recep Tayyip Erdogan on Sunday vowed to launch further cross-border offensives against terror groups as he revealed his ruling party’s manifesto ahead of snap elections on June 24. Erdogan made a series of promises about the economy and uniting the country during a rally in Istanbul attended by several thousand people. 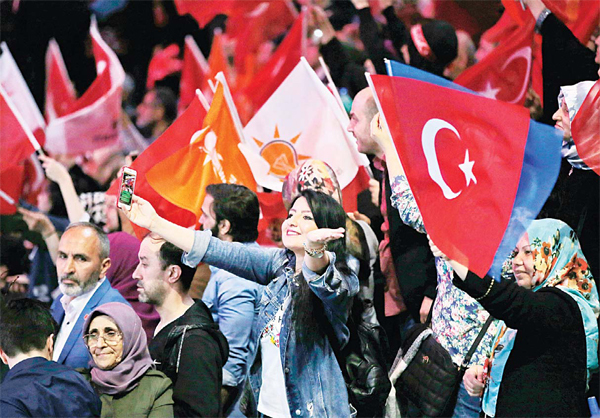 The Turkish head of state last month announced snap presidential and parliamentary elections on June 24 to the surprise of Turkish politics observers. Experts say Erdogan wants to exploit the rising nationalist feeling after an operation in Syria this year and to hold polls before the economy worsens. After June 24, Turkey will implement constitutional changes approved in an April 2017 referendum to create an executive presidency which expands the head of state’s powers. Erdogan’s ruling Justice and Development Party (AKP) came to power in 2002 and has since remained the country’s biggest political force. “June 24 is going to be a milestone for Turkey,” Erdogan said. The president said Turkey would launch cross-border offensives, similar to previous military operations in Syria, adding that Turkey would never give up its fight against terror. 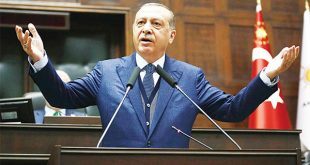 “Turkey will launch additional offensives like Euphrates Shield and Olive Branch operations to clear its border of terror organisations in the new era,” Erdogan said. Operation Euphrates Shield took place between August 2016 and March 2017 against the Islamic State group, while the Olive Branch offensive targeted the People’s Protection Units (YPG) militia in its western enclave of Afrin earlier this year. 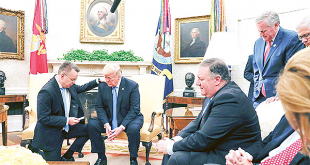 The president did not give any details on where the next operation could take place although there has been speculation Ankara could launch an offensive in northern Iraq. Turkey says the YPG is linked to the outlawed Kurdistan Workers’ Party (PKK), which has been waging an insurgency inside Turkey since 1984. The PKK has bases in the Qandil mountain area of Iraq. Erdogan also repeatedly threatened in the past to expand the Afrin offensive to YPG-held Manbij, which raised fears of a confrontation with United States forces there. During his 70-minute speech, Erdogan discussed a range of domestic and foreign issues. 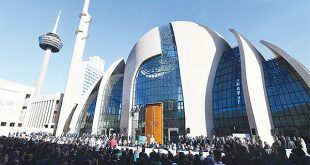 He repeated Turkey’s commitment to joining the European Union despite prior tensions with several EU member states and long-stalled membership negotiations. Erdogan highlighted the AKP’s success in starting formal membership talks in 2005. “We have absolutely not given up our objective of full membership of the European Union even if we have not seen the same determination and desire recently from our interlocutors,” he insisted. Erdogan said interest rates — despite the Turkish lira’s decline in value against the US dollar — would fall alongside inflation and the widening current account deficit. Inflation hit 10.85 percent in April while the lira has lost over 11 percent of its value against the greenback since January. Erdogan’s speech was broadcast live on all the main television channels but the main opposition Republican People’s Party (CHP) candidate Muharrem Ince, chosen two days earlier, hit back at the “media embargo” against the opposition. Ince’s first rally in Yalova, northwestern Turkey, was not broadcast live on Saturday by the main news channels including CNN Turk and state broadcaster TRT. “The TV channels which even broadcast AKP’s district congresses live did not broadcast our splendid rally live,” Ince said on Twitter earlier on Sunday, blaming Erdogan. “We will go on to break this media order. If the media embargo against the opposition at the orders of the palace continues, we will hold our rallies outside TV channels.” In recent months, Prime Minister Binali Yildirim and Erdogan have given speeches to district-level party congresses each weekend which have always been broadcast live. Next Is it mandatory for a Manager to work for 3 yrs if hired from abroad? Erdogan, when will show end?